Hearts of Worship (HOW) is in its 6th year! We are a ministry of Hearts of Hope Church and we offer classes for boys and girls. HOW teaches Ballet, Worship Dance, Jazz, Tap, Tumbling, Poi, and Worship Flags and Streamers. We also offer Art, Drama, and Fitness! We teach technique but more importantly we want the students to learn how to use their gifts to honor the Lord. HOW limits class sizes for a more personalized fine arts school experience. 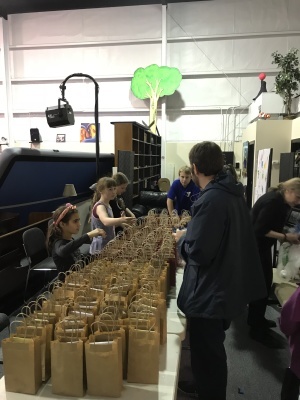 Some of our students preparing gift bags to hand out at HOW's Winter Outreach Program. At HOW you will find our dancewear and costumes are always age appropriate and modest. We require simple and classical dancewear for all our classes. -No toys, candy, or gum allowed. Labeled water bottles only. -Parent/Guardian must take child to bathroom before class. Children must arrive at least 5 minutes early, fully prepared, dressed properly. Girls hair pulled back. -Parent/Guardian of younger students must be present/waiting for child during class. -Sick children may not attend class. -Invitations for birthday parties, etc. must be cleared with Pastor Donna. Do not send invitations unless you have one for each student. -Respect will be required for the Lord, the church, the program, for others. Students will be required to listen, obey, keep hands/etc. off others. We may choose to have your child "sit out" if necessary. -No drugs, alcohol, tobacco, profanity, bad behavior, fighting (physical or verbal) allowed. -Attendance/participation in program rehearsals are required. -Dress Code: Modest, well covered dancewear required. Cover-ups must be worn to and from class(i.e. parking lot) and at HOH/HOW functions.